On December 3rd we got approved for our special use permit! The Lord definitely paved the way and gave us tremendous favor from the community, the commission, and the City of Emmett. It was great to see all of you there to show your support! 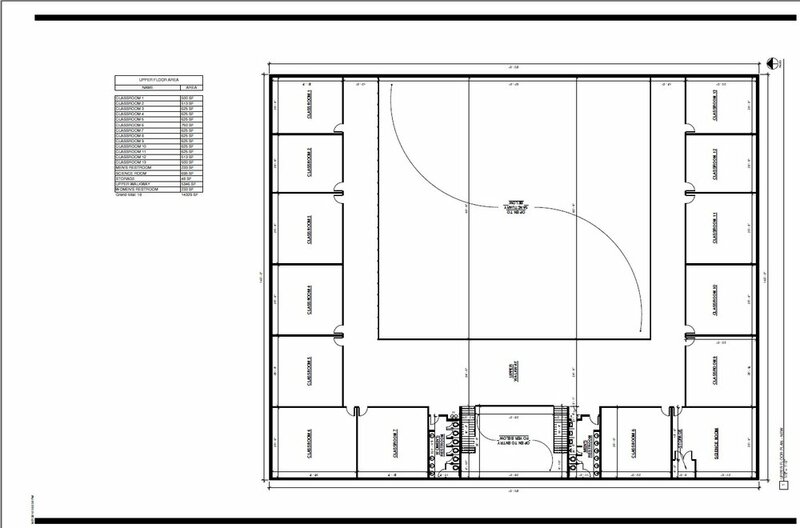 Sometime in January, we will be given the concept drawings of our new facility. Once we have these we will have a special weekend service and a separate meeting to present the plans and talk about the future. At this meeting, we will discuss cost projections and the next steps of the process. We must find a balance between these things. Obviously, we want this project to be the Lord’s work, but we know that He often uses people to accomplish His work. At the end of the day we know that where God guides, God provides. Watch your bulletin, newsletter, and email for details on this upcoming meeting. Today I received an updated plan that seems like it will work for us! I have submitted it to the Building Advisory Committee and await their feedback. We will be having a meeting within the next few weeks to finalize the plans. We also will be having an elder’s meeting to discuss next steps. Continue to pray for the Lord to direct us as we move forward as a ministry! Here are the new updated plans. At our elder's retreat I told the elders that I needed some help with the daunting task of laying out 10 acres and a 40k square foot facility. We decided to put together a building advisory committee. I have since assembled this committee. They, along with staff from the Church, School, and Daycare, have given some great suggestions and we submitted them today to the Design Team! Here are the suggested changes I sent to the Design Team. It seems that we are headed in the right direction. There are some minor things that I would like to address. 1. The East and West Hallways are still labeled North and South. 2. I am not sure why the daycare didn't get moved to the East side of the building. However, I think it will work as it is if we move the playground to the South side behind the building immediately South of the future double gym. This will probably work even better as it will give us more room for the kids to play (We potentially could have up to 300 kids.) Currently, School and Daycare only have 160ish kids, but whatever our numbers, it will be easier access to the football field. It was also suggested this would be better for our neighbors to the East, as having a playground up against their backyards would be very noisy. 3. One of my elders, who is a firefighter, suggested that we put in fire escapes on the upper level. Perhaps we could shrink the storage area and put a 4' hallway to an egress on the southwest side. 4 Also for egress, we would like exit doors on the outside of each of the daycare and classrooms on the lower level. 5. The offices at the front of the building are directly under the upstairs bathrooms. Will that be a problem with flushing noise? 6. On the plot layout, it seems that we don't have much outdoor space in front of the building. Places for benches, tables, chairs, flower beds, and planters. 7. I don't mind if the vestibule is rectangular but I would like to put a rounded facade feature on the front like the one on the church pictured on http://southwinds.org/ I like the walkways, planters and shade features they have. 8. It seems to me that the amount of parking in the plan is more than we need. Are we going to be required to put in that much parking for a gym/sanctuary (multipurpose room?) I was told by the city building official that we could use overflow parking since it is a multi-purpose room. To start out we will put out 300 chairs and have probably 250ish adults in the sanctuary. I wouldn't think we would need a parking spot for every adult, do we? If we have a bigger crowd for something they could use the graveled overflow parking. Right? 9. Backstage: I made some changes to backstage and the locker rooms I didn't put in measurements but I expanded the green room (this is a backstage room for the worship team, guest speakers, and others. It needs room for tables and chairs, couches, a refrigerator, and a countertop for a coffee bar, microwave, and an area for refreshments. I also included a bathroom as we have one in our current green room. Ideally, a green room has access to the backstage area so you can go on stage from there. I also included a wheelchair ramp for the stage and ample stage storage. 10. I am guessing our stage will be about 3' high. Will we have enough clearance with a walkway above it on the second floor? Will we have enough headroom and will it look OK? 12. We would like to add another double door for security on the North side of the East Hallway between the Stage Storage room and the Fireside Conference room. This will act to block off the school area from the enterances. 13. Can we also add an open indoor stairway in the East Hallway on the south side of the building? It would have to go where the upstairs storage room is. 14. We will need to re-work all the restroom entrances. Everyone standing outside any restroom can visually see into it when a door opens. We should make a method for modesty by blocking "line of sight" from outside the restroom to inside the restroom. 15. Where is the riser room for the sprinkler system? I am pretty sure it has to be accessible from the outside. This is the latest update from the design team. It may need a few tweaks but we should be ready to submit it to the city for approval. Pray that we find favor with the city as we submit our plans. CLICK HERE for a high resolution PDF. There are also some building modifications that are on the PDF version. N218 Update 7/3/2018 This is a possible configuration of the land layout. This weekend I announced that we had received our first draft floor plans from the design team. These plans are a very rough draft. Many changes will be made in order to accommodate all of the needs. We have submitted suggested updates and should be getting a revised floor plan soon. How is the land coming? When are we going to break ground? How soon will we have a new building?” These are the questions people have been asking since the announcement about the 4th street property at Easter service. Frustratingly, I didn’t have the answers to any of these questions! During the month of May, I felt compelled to go out of my way to drive to the property and pray. I took my family, I took each of my kids, and, at times, I went alone. We would pray, “LORD, would you work this out?” “Are you going to allow us to do ministry here in the heart of Emmett?” I know many of you have been praying similarly, thank you! On June 1st, with all seemingly against us, we finally closed, and the property officially became ours! The seller donated fifty thousand dollars and we were able to put down another fifty thousand, along with the closing costs. Because of the Lord’s provision, and your response to God’s call for generosity, we have already paid off 1/3rd of the sale price! I have no doubt God will provide all that will be needed, as it is needed, for the project. “What now?” Is the question many of you will be asking. Here is where we are: I have submitted our plans to the design team. They will work on our building plans and the landscape engineering. When they are done with the plot layout, we can submit it to the city for approval. Not long after that, we have some mock-up drawings of the building on the new property. At that point, we will give a presentation to the Church and School to determine if we are ready to move to the building phase of the project. At the end of the day, this is the Lord’s project. We must continue to look to Him and His guidance to move forward. I am grateful for all of you who have been seeking the Lord in all of this. Please continue to pray and let’s see what God can do!